BELLEVILLE, Ont. (18/01/12) - Josh Logan, 23, talks about his experiences auditioning for Canada's Got Talent. Though he didn't make it , Logan says: "I'm not mad that I didn't get it. I'm not upset. I know many people have much more talent than me. I'm excited to see if people I met and saw there, how they did." 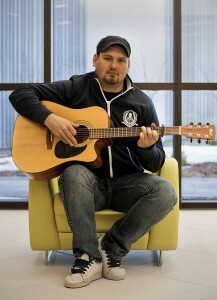 Logan, who is in his second year in the Community and Justice Services Worker program at Loyalist College, has been playing music since he was 3 years old. "I played music. I've played music my whole life," the resident of Brighton says. Photo by Melchizedek Maquiso. If you missed your chance to audition for Canada’s Got Talent recently, you can learn from one local young man’s experience of his audition. Second-year student from the community justice service program, Josh Logan, 23, from Brighton, took his chance to apply for the Canada’s Got Talent’s audition in Toronto. “I went on the website and applied right away,” Logan said when he found out about the audition tour that was happening in Toronto last fall. Logan found his talent at a young age. Logan learned after receiving an email that he did not make it but said he was neither mad nor upset because he knew many people who had auditioned had much more talent than him. “The only advice I can give is to go out and have fun,” Logan said. The Citytv series is launching a nationwide search to find Canada’s most talented performers. A casting call is going out to singers, dancers, comedians or anyone else who thinks they have a talent to share. Canada’s Got Talent premieres on Citytv this spring after hosting auditions in Winnipeg, Edmonton, Vancouver, Halifax, Montreal and Toronto this past fall. When selected, performers will perform in front of a live studio audience and a panel of judges where they will compete for the top prize of $100,000 and a Las Vegas venue performance. Citytv announced earlier in October the host and judges for Canadian’s Got Talent. Opera singer Measha Brueggergosman, songwriter Stephan Moccio and Emmy and Tony Award–winning Canadian icon Martin Short will be judges, along with current co-host Dina Pugliese from Breakfast Television Toronto. Who will be a winner of Canada’s Got Talent? Stay tuned….